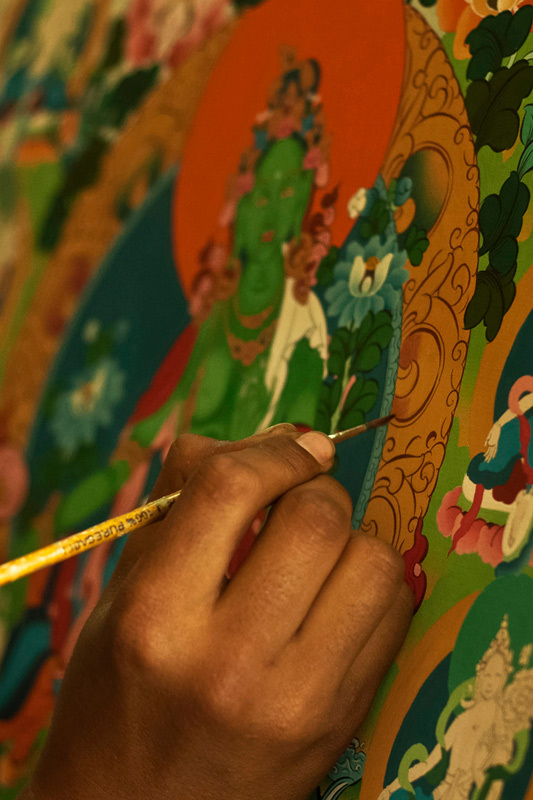 Thangka signifies iconographic information in a symbolic manner. 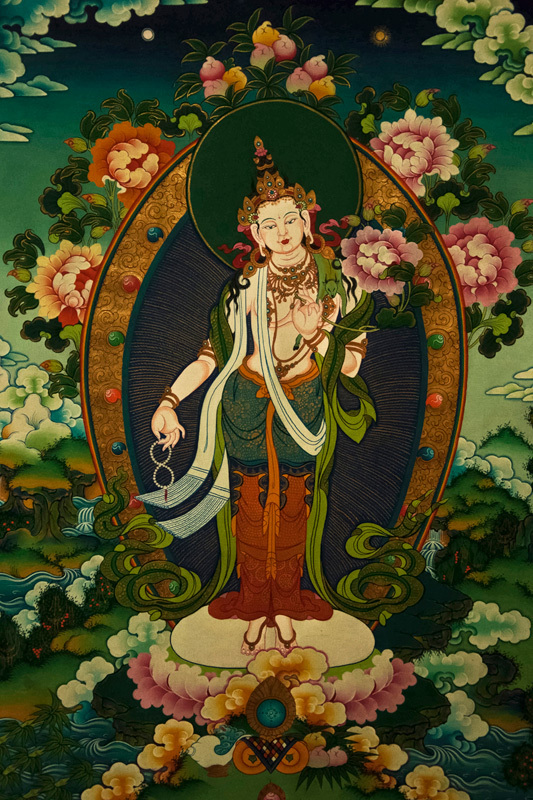 The paintings are a picture panel used for worshipping and decorating houses. 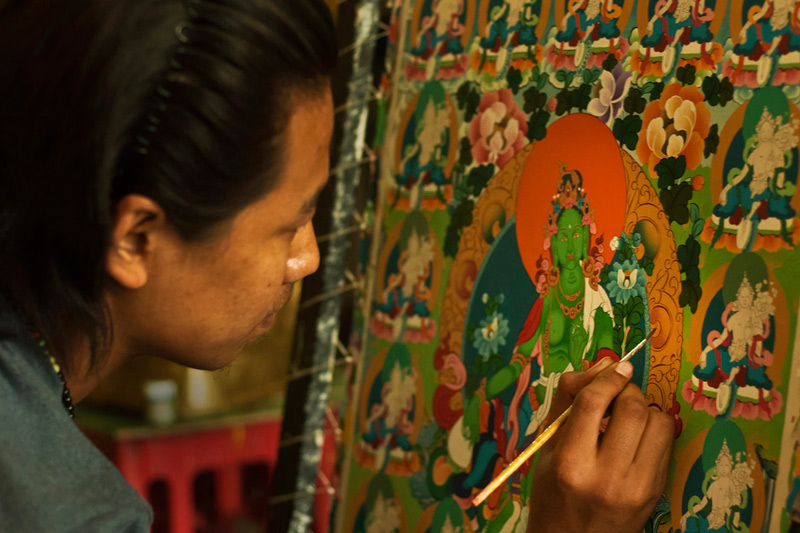 The traditional art is made on cotton or silk cloth representing Buddha and other deities. 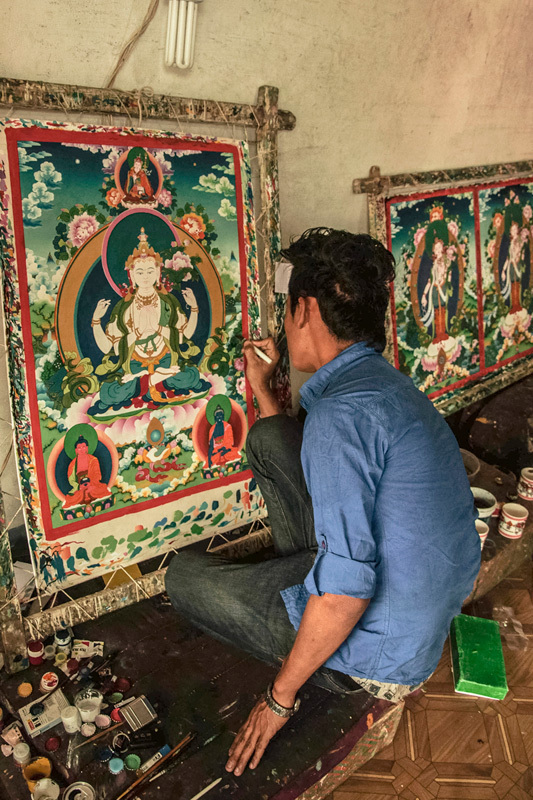 The paintings are painted and embroidered which are displayed in monastery as well as in family stand. 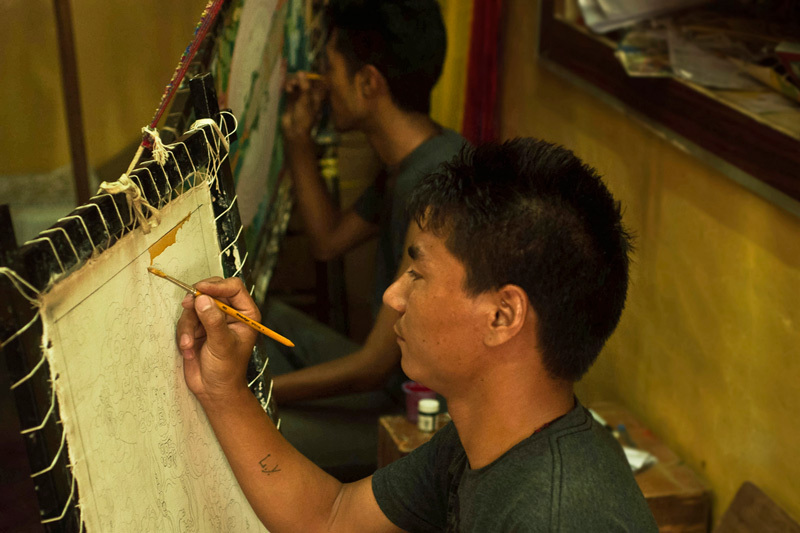 The unique art is originated during lord Buddha’s time. 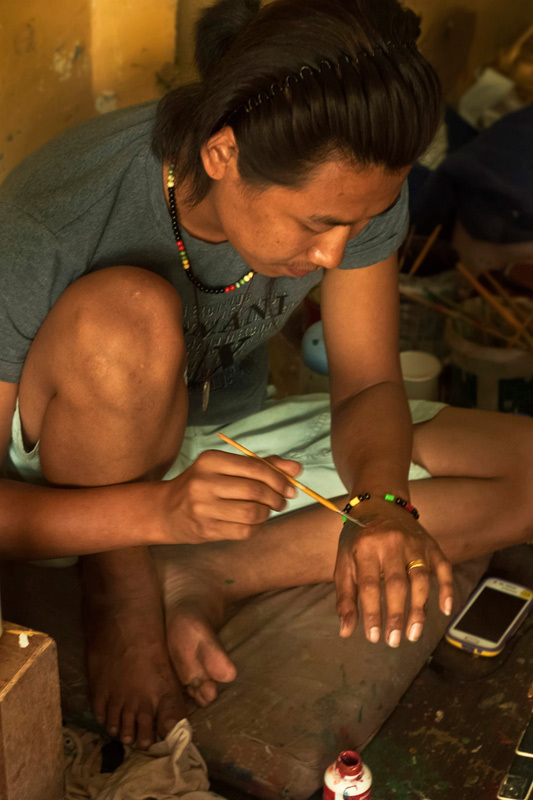 Every painting communicates a message and teaching about the represented deity. The paintings made on cotton or silk cloth that is very delicate in nature. The paintings are placed in a dry surrounding which does not affect the quality of silk. 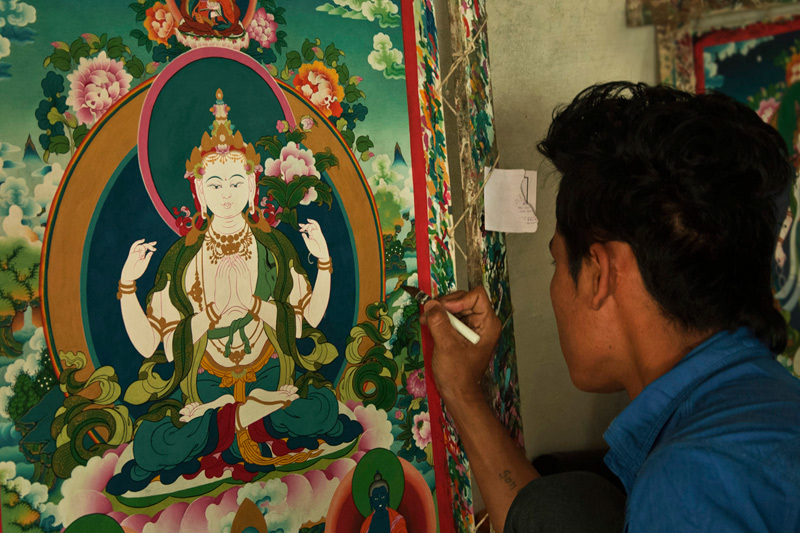 Thangka is also known as scroll painting. 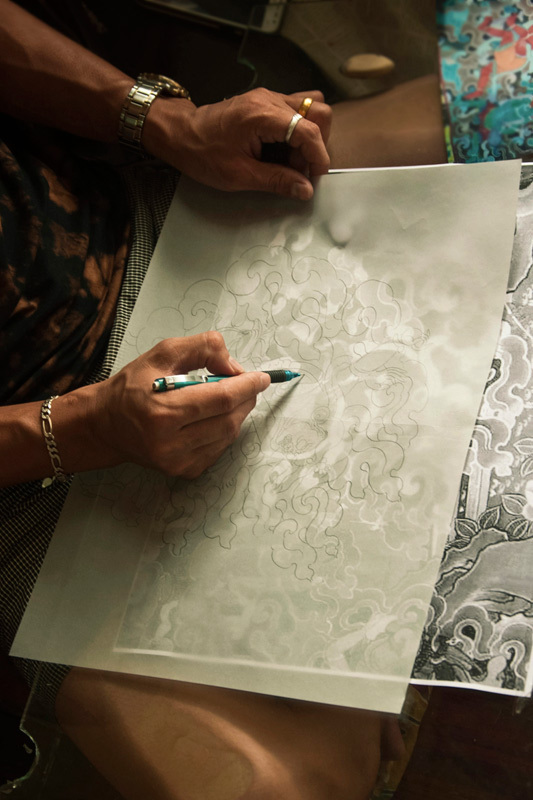 Initially, designs are drawn on a gelatin paper using pen. The cloth is tied to an iron or wooden frame using cotton threads. To avoid pores on the cloth, a mixture of distemper and gum boiled with water is applied on the cloth before painting and dried. After drying sanding is done on the canvas surface using stone or sand paper in order to make the surface smooth and even for painting. 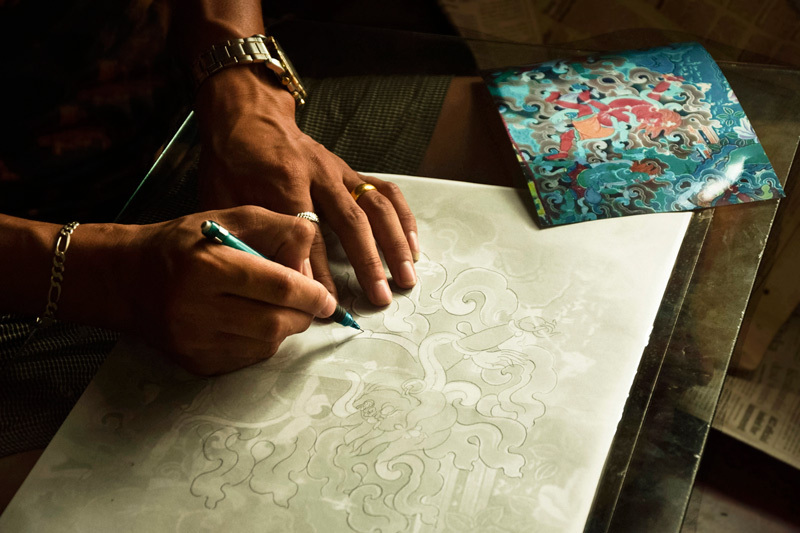 Different parts of the designs are drawn on an A/3 size paper and they are joined to make a single image. The drawings are directly drawn on the canvas with all the measurements or traced. The first part of the painting is always started by painting the sky as a background. Commercial (enamel) paints are mixed with fabric paint solution (fabric colors) to reduce the shine of the color. Vibrant colors such as Red, Blue, Green, Yellow, and White are mainly used. It requires perfect skills in drawing, perfect figures and great understanding of the econometric principles to make this paintings. Balanced grid of angles and intersecting lines are used to portray arms, legs, eyes, nostrils, ears, and various ritual implements and composite with the flawless design sky landscape using color saturation and shading which gives more embellished look and style to the painting, according to the theme. 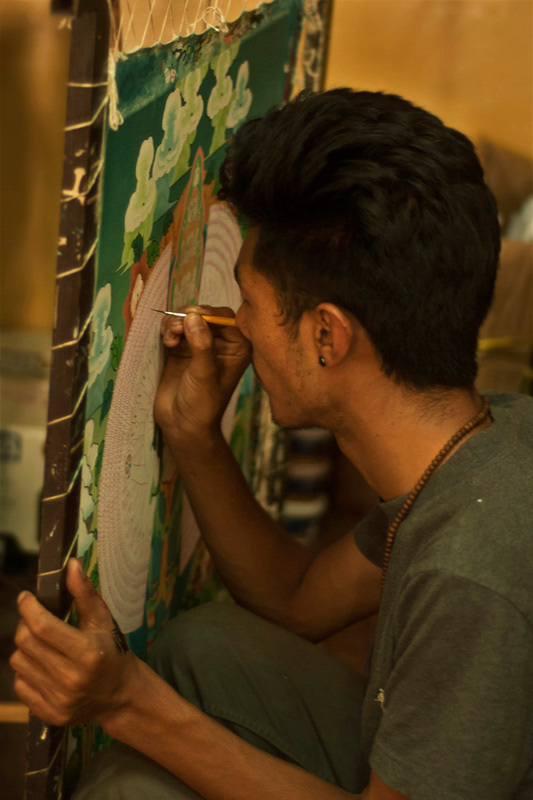 After tracing the colorful design on the canvas, artisan gives a final emboss golden touch to the painting. Small cold gold coins and leather gum is mixed in water (soaked to make a paste) is applied as final touch, which gives a glittering look. The gold finishing is done with a different brush called chew (local name), which has a glass fibers instead of hair. Cold gold is also known as “Ser” which is brought from China. After finalizing the painting they cover it with red and yellow satin cloth, as the color is symbolized as GOD wear. 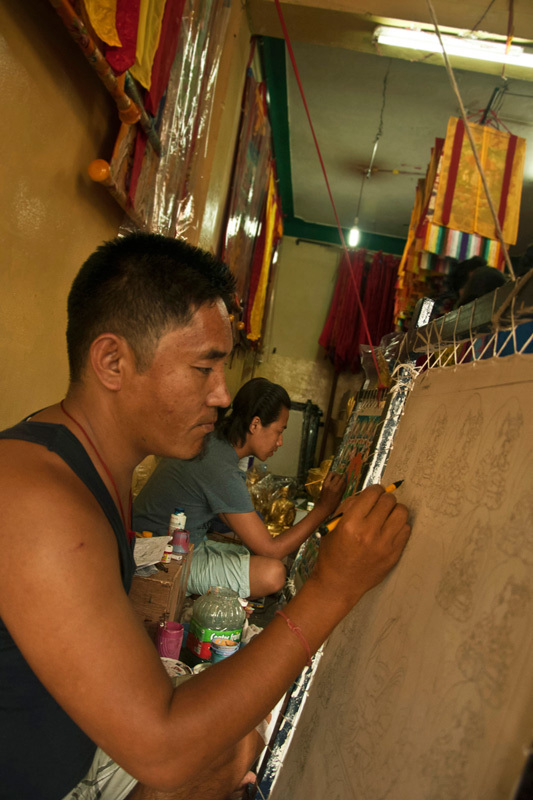 The traditional art form is basically religious that is implemented in harmony with the guidelines set in the Buddhist scriptures. More importance is given to use blue and green colors. Light colors are used more. Floral designs are made without making the outline floral. Paintings are made using the place name as base.